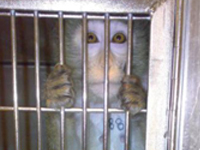 Animal Defenders International : Animal experiments : Have your say on primate testing! Have your say on primate testing! The European scientific committee, SCHEER, has published its preliminary opinion on primates in research. We are submitting our response with detailed information on replacing primates with non-animal methods. You can take part, too! By downloading and submitting our virtual postcard, you can help to outline the main concerns with SCHEER’s opinion, which the European Commission will use to inform their update of European laws on animal experiments. The deadline for submissions is Sunday 26 March 2017, so please take action today! 3. Fill in personal information as required. 4. Where it says ‘Table of contents’, select ‘SUMMARY’. 5. 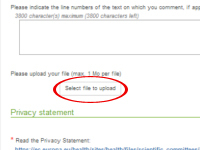 Go to the bottom of the page to the ‘Select file to upload’ button, as indicated in image. 6. Select and upload the virtual postcard. A timetable for phasing out primate experiments is essential to drive the implementation of replacement and provide a route to end their use. Replacement must mean replacement! The use of other animal species, such as mice and pigs, over primates, is misrepresentation of the definition of ‘replacement’. Unsubstantiated claims about the necessity for primate experiments. Mentioning casual “similarities” between humans and other primates is NOT scientific evidence that primate species are indispensable in research. If you are having any difficulties submitting the postcard, or know someone who would like to respond to the European Scientific Committee preliminary opinion on primates in research, but is unable to get online, please call 020 7630 3340 for assistance. UK Action: Write to your MP and ask that they secure the government’s commitment to transfer all EU laboratory animal protection regulations into UK law, as the UK leaves the EU. Ask them to support establishment of a timetable to phase out the use of primates in experiments.